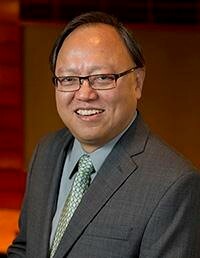 Dr. Roger D. Huang is the Martin J. Gillen Dean for the Mendoza College of Business at the University of Notre Dame and the Kenneth R. Meyer Professor of Global Investment Management. He holds a B.S. in Industrial Management from Purdue, as well as master and doctorate degrees in finance from the Wharton School at the University of Pennsylvania. Dr. Huang teaches global finance in the Executive MBA program and multinational financial management in the MBA program. His areas of research expertise are international financial management and financial market microstructure. Dr. Huang joined the Notre Dame faculty in 2000 after previously teaching and conducting research at Vanderbilt University, the University of Florida, MIT and Purdue University. He was voted the best teacher in the Executive MBA program four times, as well as the best teacher in the MBA program; he also has received the Teaching Excellence Award on three occasions. He has written extensively on the subjects of world financial markets and trading. Dr. Huang previously served on the board of Bon Secours Health System, Inc., as well as the Nasdaq Review Council, and has received numerous fellowships and grants.